I like this neat and rather rare 1949/50’s Ladies Movado Day and pointer Date calendar complication model I picked up in Auction recently. 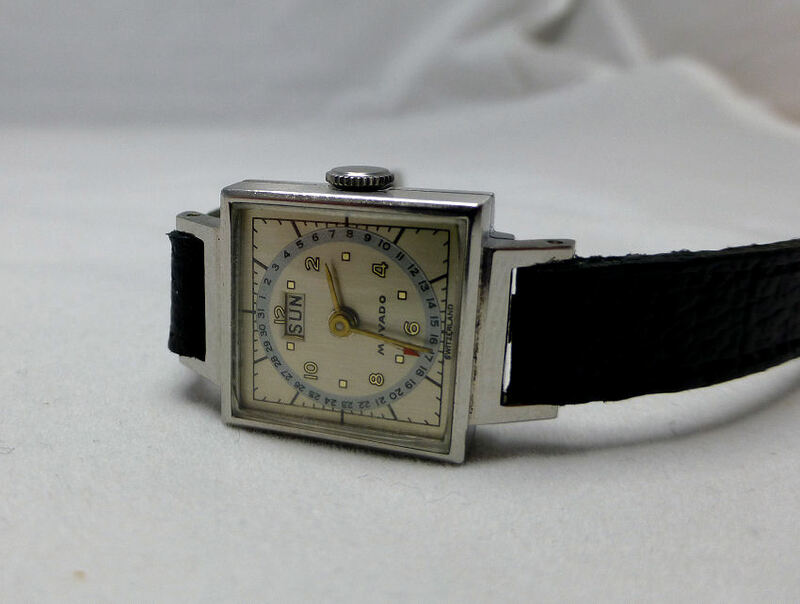 Dated around 1950 maybe it has a 15 jewel manual wind Movado signed movement and a very neat layout dial with a three letter Day window @12, a red tipped Date Pointer with calendar perimeter index, with direct pin side calendar adjusters in addition to the main crown. 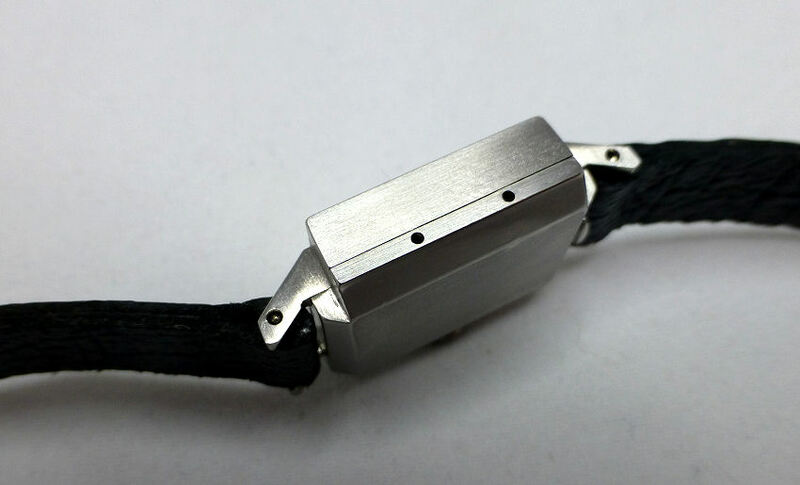 The very solid looking square case is stainless steel and measures just 12 mm wide with a slightly domed crystal. The case is stainless steel and the back is a tight snap fit. The black leather strap is a standard 8mm fit, so easily interchangeable if needed, though this one is virtually new and recently fitted. This watch is in decent condition with few signs of wear at all except for one tiny ding on the back, which actually is of no consequence. The important thing for me about buying any of these small complication watches is the mechanics. Do they work? In this case there is a 3 letter Day wheel and a Date Pointer, both of which require setting – and on this model they do. Movado direct adjust Day and Date apertures. 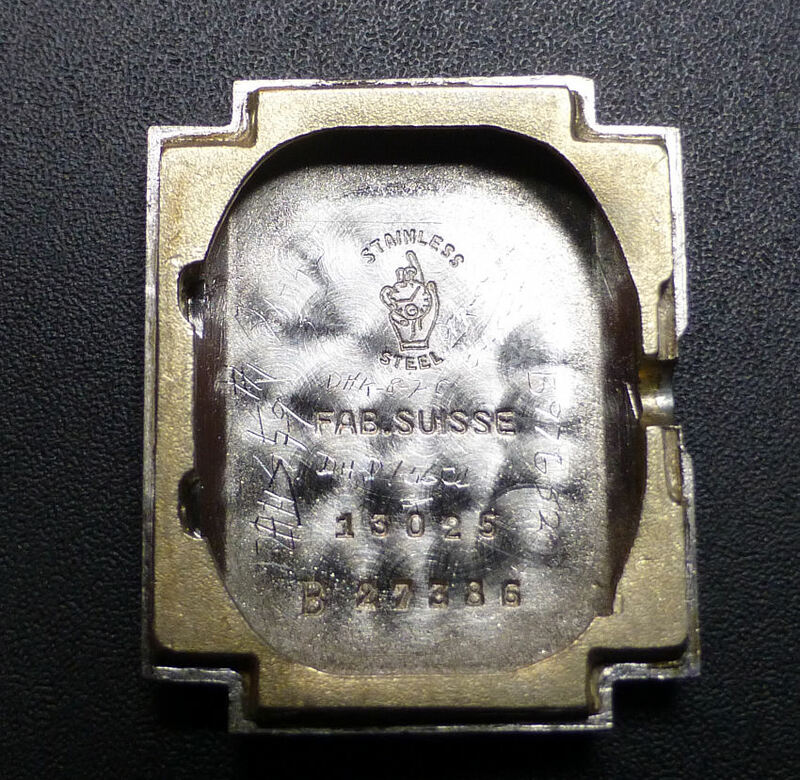 The problem with Auctions is that anybody and his dog have access to fiddle with the items (I’ve seen people open watches, get screwdrivers out and start poking inside – I kid you not!) and whilst the Auction House may indicate in their Condition Report that it winds and appears to run, that’s usually about it. It is very definitely up to you to ensure it and for this model, that the complications work. 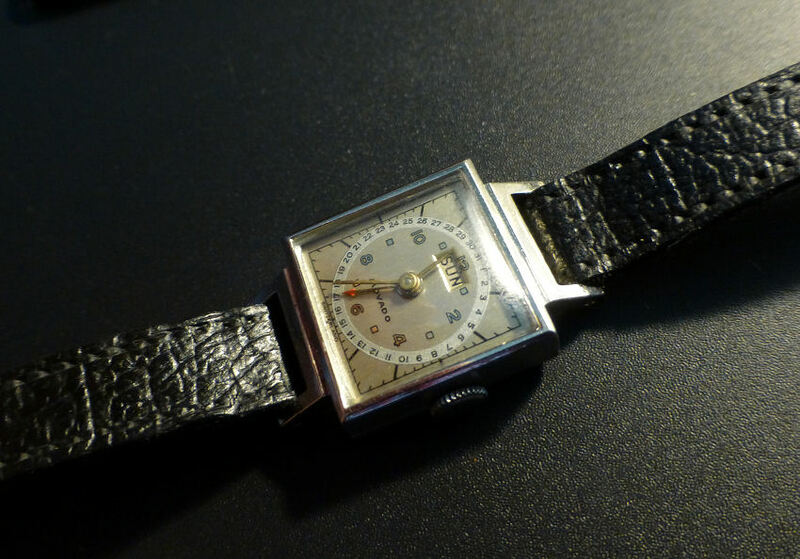 This Movado is a manual wind and has two tiny little pin adjusting holes on the left side, positioned at about 7 and 10 on the outside of the case. These adjust the Day and the Date independently of the Crown which simply alters the hour and minute hands (the time). As said fortunately they work on my one, though once I’d had a close look inside I found one of the adjusters was bent out of position. If left in that condition it could mean that inserting a pin could easily slide past the adjuster and stab the movement in it’s vitals! Not good at all . . . The adjuster levers in this model are side sprung, to enable them to move and line up with the internal case apertures and the pin holes. So I re-centered them and set them into the correct position. Now if you insert a pin to adjust, it will hit the adjuster dead centre and operate the mechanism as it should. So a word of warning when you meet a model with pin hole adjusters. Have a real careful look to see and/or feel the adjuster, before stabbing it harder and harder! Get it wrong and you can easily damage the movement. NOTE – if you check out the image of the movement above you might just make out the adjusters at the bottom of the image (in the shadow – sorry) – on the underside of the M of Movado and the C of Factories. There are 2 levers which move side to side, sprung – but straighten these and they fit nicely into the case apertures and pin holes. These ones both work as they should, so adjusting the time, Day and Date is easy. 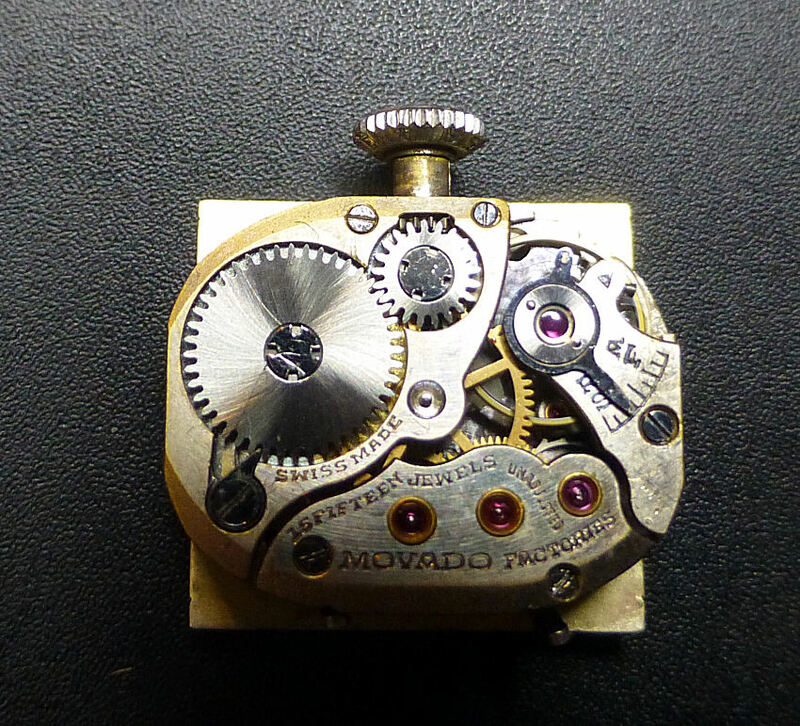 In fact easier than many modern complication efforts – and amazingly it’s all contained in a very small movement within a small 17mm x 12mm case. Yet to get hold of my Wife to get a wrist shot, but when I do, I’ll add it here at the end . . . . after this shot of it lying on my office desk. Note – Oh as usual – if you don’t know, if you click on any image you should get an enlargement . . . . .